Saudi Aramco underlined its vision to lead digital transformation in energy sector and also discussed the Fourth Industrial Revolution, where smart digital technology has become an inseparable part of businesses. The strategy of Saudi Aramco’s Power Systems Department is in harmony with Vision 2030 objective of making the kingdom a global energy hub and the company’s local content strategy represented in the In-Kingdom Total Value Add (IKTVA) program, both of which require a comprehensive transformation in technical and vocational training, said senior company officials at a key event in Jeddah. 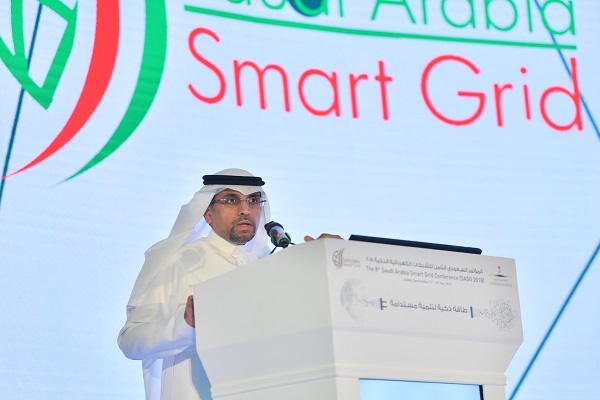 The 8th Saudi Arabia Smart Grid Conference (SASG 2018) was held last week under the patronage of His Excellency Khalid A. Al-Falih, Minister of Energy, Industry and Mineral Resources. Speaking at the event, Abdulkareem Al Ghamdi, the VP for Power Systems, underlined Saudi Aramco’s vision to lead digital transformation in the energy industry by delineating an approach that supports its technical and administrative activities based on the application of effective technologies. He cited a number of projects that the company is implementing, such as the use of robots and self-guided autonomous devices in remote inspection and maintenance in plant areas, and the installation of smart sensors with advanced analytic capabilities that are connected to advanced digital systems. Such technologies play an effective role in reducing operating costs and enhancing safety, he noted. Al Ghamdi also discussed the Fourth Industrial Revolution (IR 4.0), where advanced, smart digital technology has become an inseparable part of businesses and industries given its integration in the physical, digital and critical spheres. This connection is clear in robotics, artificial intelligence, nanotechnology applications, computing and the Internet of Things, he stated. Al Ghamdi pointed out that Saudi Aramco deploys smart control systems in the area of power generation, including the construction of the smart digital control center (iPower) in Dhahran, which is involved in all the company’s operations across the kingdom. The center aims to achieve a number of strategic goals, such as enhancing the effectiveness of power generation, transmission and distribution; asset management; and the improvement of safety and reliability through the implementation of real-time power management systems in all future power generation projects, he noted. In this regard, Al Ghamdi said that Saudi Aramco has entered into strategic partnerships with leading scientific institutions and universities specialized in technology and digital applications, including six training centers for girls in the technical and administrative fields.